I have been wanting to make gears for some time. One of the principal tools required for gear making is an indexing system of one form or another. As the gears I want to make have a significant number of teeth the thought of manually indexing the rotary table filled me with dread! Losing my place, forgetting the number of turns of the index arm or the numerous other errors I was liable to make, meant automating the process was essential. 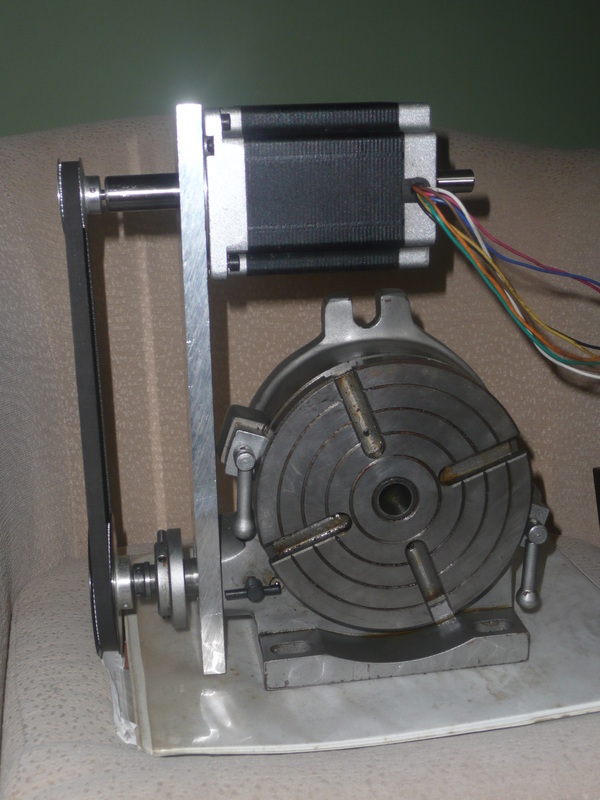 Hence the need to convert my manual 6" Vertex rotary table to CNC. The milling machine I have is a Denford TRIAC PC - this still runs using the original Eurostep controller and can only be converted to incorporate a 4th axis at great expense. Therefore I will have to use another signal generated by the Denford TRIAC in order to move the table to the next position. The first go at conversion was a failure! The plate I laboriously produced split in two - it was too thin and the bolt holes too large to hold the weight of the stepper motor. So a new plate was made bearing in mind the lessons learned. The plate was made and a toothed belt and gears were bought. The plate is 300mm x 87mm. Holes for fixing the stepper motor depend on the size of stepper motor. The Vertex table was dismantled, cleaned and re-greased to provide a very smooth, snag free operation. The backlash adjustment was left in place and is still usable. 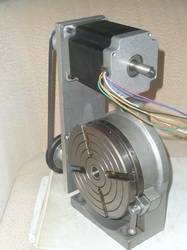 Photos show 3 views of the rotary table. 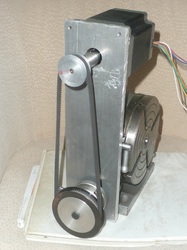 The drive is via a toothed belt with 2:1 reduction. The rotary worm drive on the Vertex rotary table provides a 90:1 reduction. This means 72,000 steps per revolution with the motor set to 200 steps per revolution. 200 steps of the stepper motor moves the rotary table 1 degree. 72,000 steps for 360 degrees. The software initially used was Algorithm Builder (see links section) which was great to design the user interface and many of the functions needed. However a problem eventually surfaced - I needed a floating point package in order to work out the gear teeth spacing in number of stepper motor steps. The software was re-designed using Arduino - There are a number of useful libraries available for the Arduino and floating point is available. With Algorithm Builder I would have needed to have built a floating point suite, further delaying this project! The stepper motor is driven from a commercially available stepper motor controller and power supply. Step - enter a step value, anything up to 71,999, but using the clockwise/anticlockwise facility is quicker for values > 36,000. Gear - enter the number of teeth to cut a spur gear, value up to 500 teeth. Numbers and decimal point - used to enter step, degree or gear teeth values. The keyboard has yet to find a suitable enclosure, at the moment it is used for debugging the software. So awaits a box to enclose the electronic controls. The key legends were printed with a word processor and cut to size to fit key indent. Conveniently the tops of the keys have a square indent which enables the key legends to be automatically aligned in x and y. When completed, the complete Arduino sketch will be included here. There are intermediate sketches in the download section.